The father of pension fund management shares essential lessons to building a businessAs the world's leading pension fund consultant, George Russell's advice has been sought by many of America's largest corporations. A pioneer in this business since the late 1960s, Russell has seen a lot. Now, he shares his experiences in this field with you, and provides valuable insights into what it takes to succeed in business today.Broken down into ten chapters, Success by Ten describes significant moments in the origins and development of pension fund consulting and the institutional investment industry. This history is intertwined with Russell's own personal story and the innovations that his company introduced to the industry. * Author George Russell is well known to many throughout the investment industry as the first pension fund consultant * Each chapter represents a business lesson that Russell has learned during his career * Outlines a people-centric approach to building a successful corporate cultureTaken together, the innovations outlined throughout these pages spurred the professionalization of pension fund management, with the potential benefit of improving financial security for everyone who is investing for retirement. 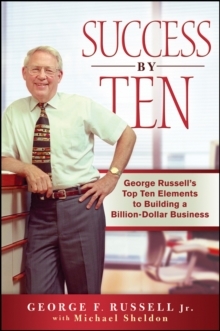 In Success By Ten, Russell discusses the development of these innovations and reveals how you can apply them to build a better business.